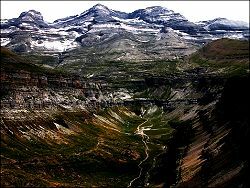 The Ordesa and Monte Perdido National Park at the north of Huesca province in Aragon includes one of the highest peaks in the Pyrenees, the Monte Pedido, at 3,355m, and sits roughly midway along this mountain range. 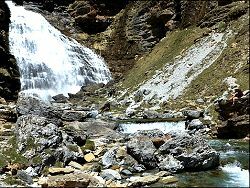 The park extends to 15,000Ha and includes lush green valleys and forests, high meadows and steep slopes, surmounted by the high peakswith glaciers. 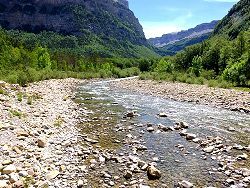 The Ordesa valley, with its attractive rock formations on either side, coming down from the Monte Perdido faces west and catches plenty of the moist air coming in from the Atlantic (most valleys in the Pyrenees face either north or south) leading to a lush flora. Above the tree line, many seasonal wildflowers including edelweiss, gentians, orchids, violets, belladonna, and anemones, can be found in the meadows. 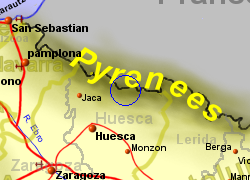 The birdlife in the park runs to 170 species, including golden eagles, griffon vultures and alpine finches, while the mamals present include ibex, wild boar, otters and foxes. There are a wide variety of walking and climbing opertunities in the park which has unrestricted access from May to mid November though snow can be a problem at either end of the season. 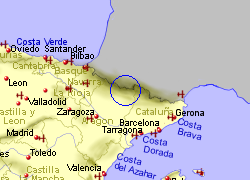 The park can become quite busy during mid August when most of Spain is on holiday. 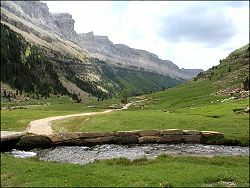 The official Ordesa National Park website can be accessed here. 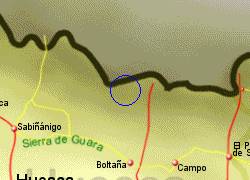 Map of the Ordesa National Park area.